Phalaris bulbosa auct., Phalaris nodosa L., Phalaris stenoptera Hack., Phalaris tuberosa L., Phalaris tuberosa var. stenoptera (Hack.) Hitchc. Bulbous canary grass (Phalaris aquatica L.) is a valuable pasture forage of Mediterranean origin that is used worldwide. Bulbous canary grass is a tufted, deep-rooted, rhizomatous perennial grass that can reach a height of (0.6) 1-2 m. Its stems are erect and hollow, and may be over 1 cm in diameter. The plant is covered by a waxy coating giving a blue-green appearance. The leaves are hairless, flat, linear, and about 40 cm long x 2 cm wide. The leave sheath is reddish in colour. The inflorescence is a dense, oblong to cylindrical panicle, 5-15 cm long and 1.5 cm in diameter. In its early stages the seedhead has a spike-like appearence that opens slightly at maturity. The seeds are cream to pale in colour, smooth and shiny, about 3 mm long. A thousand seeds weigh about 1.13 g (Culvenor, 2007). Bulbous canary grass can survive for 10-15 years (Ecocrop, 2016). Phalaris aquatica is mainly used as a pasture species but also as hay and silage (Culvenor, 2007). In the USA, it is used for the improvement of annual grass ranges as it starts growing earlier and stays green longer than native grasses (Dyer, 2005). In Australia, it is valued for its ability to provide good quality fodder to all types of grazing livestock for 8 to 12 months a year (Watson et al., 2000). Phalaris aquatica originated from Southern Europe (Portugal, Spain, Italy, Southern France, Crete, Greece, Croatia, Bulgaria), North Africa (Morocco, Algeria, Lybia, Tunisia) and the Caucasus (Azerbaijan). It was introduced, and is now widely naturalized, into South Africa, Australia, New Zealand, Ireland, the UK and the USA (USDA, 2016). In Australia, bulbous canary grass pastures cover about 1.6 million ha (Popay, 2015). Bulbous canary grass is a cool season perennial that grows mainly during autumn, winter and spring (Ecocrop, 2016). It is a fast-growing grass that keeps growing during winter and reseeds readily (Dyer, 2005). It responds quickly to early autumn rainfall (Watson et al., 2000). Phalaris aquatica can be naturally found along roadsides, water courses, field borders, foothill grasslands, woodland glades and waste areas (Popay, 2015). It grows from sea level up to an altitude of 1200 m. It does well in Mediterranean-like climate areas (Dyer, 2005). It requires 500 mm annual rainfall with good distribution from autumn to spring for optimal growth (Watson et al., 2000). However, it can grow in places where annual rainfall is as low as 300 mm provided the soil has good moisture holding capacity (Dyer, 2005). Optimal growth is obtained where temperature is between 15 and 25°C. As a typical Mediterranean species, bulbous canary grass can survive both low winter temperatures with severe frosts, and high summer temperatures. It continues to grow during mild winters. Phalaris aquatica does well in most soils, from shallow acidic ones to deep self-mulching alkaline ones. It responds positively to most fertilizer applications. In acidic soils, it is poorly tolerant of Al3+ but can withstand high levels of manganese (Watson et al., 2000). It generally does better in deep heavy textured, fertile soils. It is tolerant of waterlogging and is a drought-resistant species. It outcompetes many grasses such as cocksfoot (Dactylis glomerata), fescue (Festuca spp.) and perennial ryegrass (Lolium perenne spp.). In drier areas, the depth of the soil is an important factor for its survival: the deeper the soil, the deeper the roots can grow and find water. In low rainfall areas soil moisture holding capacity is of utmost importance for its persistence (Dyer, 2005; Watson et al., 2000). Bulbous canary grass is a perennial grass intended for long-term pastures. However, it requires careful management during the early stages of establishment. It can be sown alone or with a companion legume such as white clover (Trifolium repens), subterranean clover (Trifolium subterraneum) or alfalfa (Watson et al., 2000; Gyamtsho, 1990). In New Zealand, mixed stands of bulbous canary grass and alfalfa yielded 13-15 t DM/ha (Gyamtsho, 1990). Phalaris aquatica can be sown at a depth of 5-10 mm maximum in a well-prepared seedbed. It can be broadcast or aerially sown. 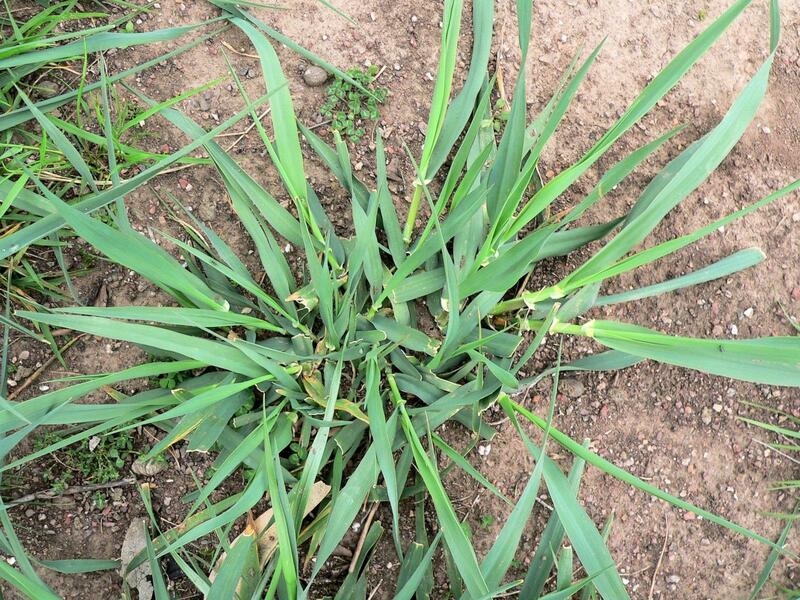 It is important that weeds have been controlled prior to seeding as bulbous canary grass is sensitive to them in its early stages of development. Bulbous canary grass should not be sown under cover crops such as oats, barley grass or wheat, which compete too strongly with it. 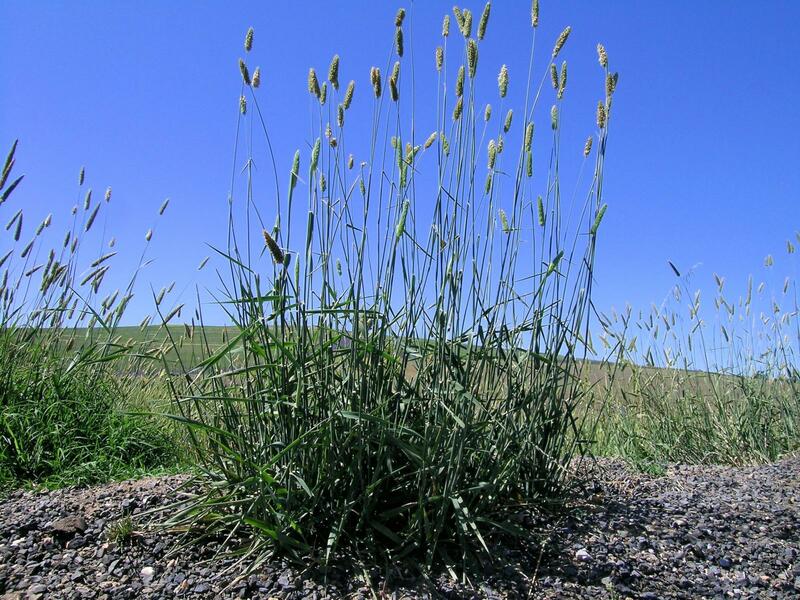 Undersowing bulbous canary grass may reduce its production by 40 to 90% (Watson et al., 2000). The establishment period is critical to further productivity, and at this stage it is important to prevent attacks by insects, slugs and snails, and competition by weeds and annual grasses (Watson et al., 2000). During the establishment period, grazing should not be allowed before flowering and seed setting have occurred. A rest period before seed setting promotes plant development and the dormancy of basal buds during summer, and allows vigorous regrowth at the onset of autumn rainfall. Once established, Phalaris aquatica should be managed to enhance persistence and maintain companion legumes. It is recommended to use light grazing to reduce the leaf litter before the first autumn rains. However, in warmer summer rainfall areas, stem residues should not be removed until late summer as this inhibits summer growth, protects any new growth that does occur and reduces soil erosion around crowns. Early autumn grazing promotes clover germination. Once rain has occurred, the stand should not be grazed for 6 weeks. Then it can be rotationally and moderately grazed during winter. In spring, livestock can enter the sward at a high stocking rate and graze Phalaris aquatica for short periods to a height of 10 cm, or to the half leaf stage so that forage quality remains high (Watson et al., 2000). It was shown that bulbous canary grass was more persistent under rotational grazing than under continuous grazing (Lodge et al., 2000). If the priority is on stand persistence, the plants should be allowed to rest until seedhead emergence (Sergeant et al., 2009). 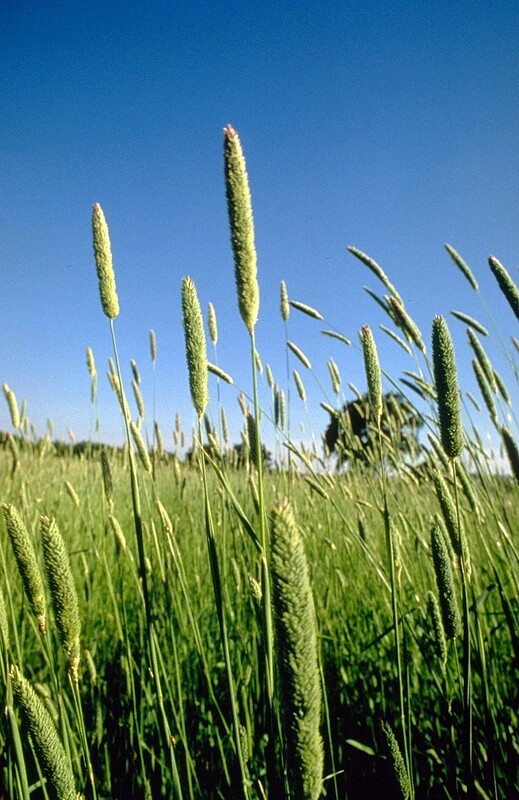 In Australia, Phalaris aquatica is regarded as a competitive robust plant that can control many serious pasture weeds. However, it may compete with companion legumes and thus reduce pasture quality and productivity (Watson et al., 2000). 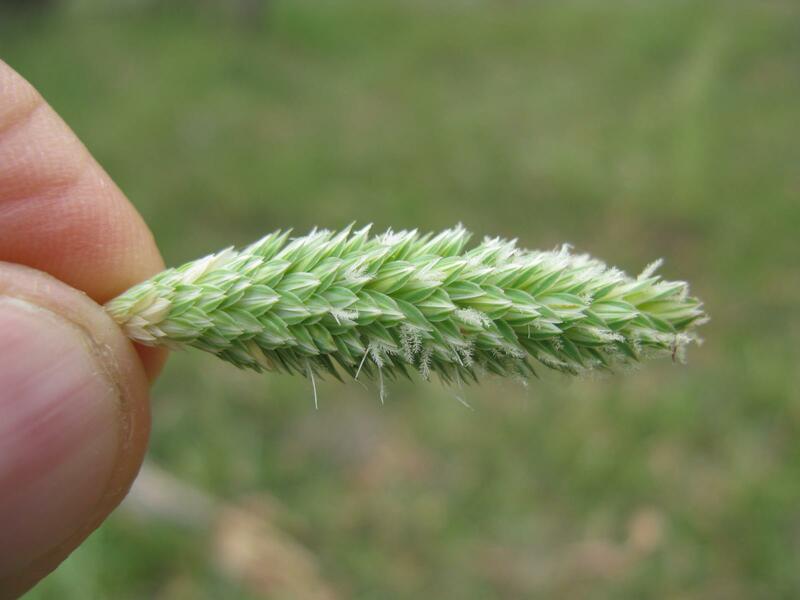 Phalaris aquatica was reported to make excellent recovery after bushfires. In California, the species has been sown for establishing vegetation after fire (Harrington et al., 2000). It has a marked ability to regrow after attacks of plague locusts or wingless grasshoppers, and of many others pests (Watson et al., 2000). The nutritive value of Phalaris aquatica is high during its vegetative stage with a crude protein content higher than 20% of DM, and in vitro DM digestibility around 80%. However, it decreases quickly after tillering, and has little feed value after flowering (Watson et al., 2000). When compared at identical stages of maturity, the nutritive value (protein and fibre contents, digestibility) of bulbous canary grass is in the range observed for other temperate grasses such as cocksfoot, fescue, ryegrass and Yorkshire fog (Holcus lanatus) (Watson et al., 2000; Walsh et al., 1987). The protein content of vegetative bulbous canary grass can be higher than that of many grazed temperate grasses. For instance, protein content and digestibility of Phalaris aquatica were higher than those of Wimmera ryegrass (Lolium rigidum), for a similar cellulose content (Freer et al., 1984). The protein content of its green leaves was higher than that of fescue, and higher than that of most native grasses of the Northern Tablelands in South-Eastern Australia (Archer et al., 1988). In winter the protein content of bulbous canary grass was similar to that of perennial ryegrass and higher than that of Yorkshire fog. The decline in protein content during spring was slower for bulbous canary grass compared to that of Yorkshire fog and perennial ryegrass (Walsh et al., 1987). Some authors have observed that bulbous canary grass can have high contents of Na and P compared to other grasses, but lower than that of legumes (Archer et al., 1988). Phalaris aquatica has been involved in the poisoning of sheep, goats and cattle, causing locomotion disorders ("staggers") or a rapidly lethal nervous or cardiac syndrome ("sudden death") (Binder et al., 2010; Bourke et al., 2006; Bourke et al., 2005; Bourke et al., 2003b; Bourke et al., 2003a; Watson et al., 2000). However, in South-Eastern Australia, it is considered that the many benefits of bulbous canary grass far outweigh the risks of livestock poisoning because the incidence of toxicoses remains very low (Watson et al., 2000). These toxicoses may be caused by indole alkaloids (such as thiamine or pyridoxine) or phenolic amines (tyramine compounds) (Bourke et al., 2006; Bourke et al., 2005; Bourke et al., 2003a; Bourke et al., 2003b). Indole alkaloids are related to bulbous canary grass-related staggers syndrome, but do not cause sudden death which may be linked to the presence of phenolic amines (Bourke et al., 2006; Watson et al., 2000). Peracute ammonia toxicity has been demonstrated to be the final event in sudden death poisoning, and toxins involved in the urea cycle enzyme inhibition could be involved (Bourke et al., 2006). The staggers syndrome could occur in livestock grazing pasture grown on soils with moderate to low cobalt levels, or with high manganese levels that reduce cobalt availability (Watson et al., 2000). Toxicity occurred more rapidly in old varieties of bulbous canary grass that were not selected for their lower indole alkaloid content (Watson et al., 2000). Staggers may be prevented by supplementing livestock or by top-dressing pasture with cobalt. Indeed, sufficient cobalt in the rumen may prevent the fast breakdown of indole alkaloids by rumen microflora and thus its absorption into the animal’s blood stream (Watson et al., 2000; Dewey et al., 1958). Sudden death appeared to be related to new plant shoots during periods of moisture stress (Bourke et al., 2003a; Watson et al., 2000). Risks are also higher under restrictive grazing systems, such as rotational grazing (Watson et al., 2000; Bourke et al., 2003a). The period of greatest stress is the first 48 hours after animals entered toxic pastures. The use of "sentinel" animals on suspect paddock during an outbreak period before allowing the main flock to graze is an usual practice in Australia (Bourke et al., 2003b). In vivo digestibility of bulbous canary grass (measured in sheep) was reported to be high during winter, with values comprised between 75 and 80% (Archer et al., 1988; Walsh et al., 1987; Freer et al., 1984). However, digestibilities of bulbous canary grass and other temperate grasses such as perennial ryegrass or Yorkshire fog follow the same declining pattern, with a sharp decline during summer (Walsh et al., 1987). During spring, the in vivo digestibilities of bulbous canary grass and Wimmera ryegrass (Lolium rigidum) were comparable (Freer et al., 1984). They were also comparable to that of legumes such as subterranean clover (Trifolium subterraneum) and alfalfa (Medicago sativa) in spring, but it was lower than that of alfalfa in summer. In earlier spring, bulbous canary grass had a higher digestibility than fescue (Festuca arundinacea) and 6 other native grasses of the Northern Tablelands in South-East Australia. In summer, bulbous canary grass was also among grasses of higher digestibility. It was concluded that the digestibility of bulbous canary grass and fescue did not differ much during the year and remained higher than that of native grasses, especially during winter (Archer et al., 1988). The digestibility of a bulbous canary grass and white clover pasture could reach values close to 70% during winter but was also very low during summer (less than 40%). Mixed stands of tall fescue and white clover had a higher and more constant digestibility (55-65%) over the year. In the Northern Tablelands of Australia, Phalaris aquatica intake by sheep was among the highest when compared to native grasses in early spring or in summer (Archer et al., 1988). Intake by sheep was reported to be comparable to that of Wimmera ryegrass in spring or in summer, and always lower than that of legumes, especially when compared at a same digestibility level (Freer et al., 1984). The performance of sheep grazing Phalaris aquatica pastures can be similar to that of sheep grazing alfalfa, and better than that obtained with other temperate grasses. Bulbous canary grass pastures compared to alfalfa stands gave the highest weight gains in ewes during winter, and in lambs during spring, but the lowest during summer. For this reason, it was suggested that bulbous canary grass pastures are suitable for breeding ewes and wool production, while alfalfa is better suited for spring-born prime lamb production (Watson et al., 2000). Compared to fescue pastures, bulbous canary grass pastures tended to produce heavier sheep in winter and spring, and lighter in summer (Watson et al., 2000). However, these results are not consistent with those obtained on bulbous canary grass/white clover or fescue/white clover pastures, as sheep gained live-weight on fescue/white clover, but lost weight on bulbous canary grass/white clover in summer and autumn, gained more weight from fescue in spring and showed weight maintenance in both pastures in winter. Sheep grazing tall fescue/white clover were about 5 kg heavier each year, and produced about 0.6 kg/head more clean fleece weight. In this experiment, the wool production per head of sheep grazing tall fescue/white clover at 15 sheep/ha was similar to that of sheep grazing bulbous canary grass/white clover at 10 sheep/ha (Ayres et al., 2001). 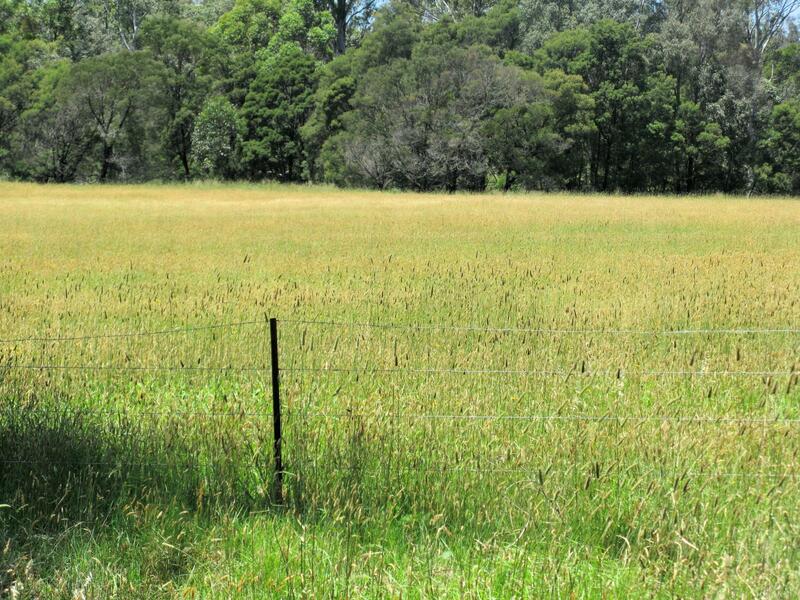 In Australia, bulbous canary grass only maintained a moderate growth rate in cattle, which performed better on alfalfa pasture (Watson et al., 2000). A reason may be that cattle have a limited ability to select the more attractive components of the pasture in winter or in summer, compared to sheep. Literature on the utilisation of bulbous canary grass in rabbit feeding is very scarce (June 2015). It is used in India (Tamil Nadu) as common green fodder during winter. In association with oats, tagasaste (Chamaecytisus proliferus) green foliage and fresh carrots, bulbous canary grass provided good growth performance in New Zealand White rabbits (Sakthivel et al., 2015). Because of its relatively high content of ether extract for a grass (4.9% DM) giving it an estimated energy value of 8.2 MJ/kg DM for the green aerial part, it is a possible feed for rabbits (Lebas, 2013).